In an era where the standard of Basic and Senior High school education in the Volta region continue to take a nose dive coupled with poor and inadequate classroom infrastructure, an educational charity organisation, Pencils of Promise (PoP) have officially entered into a Memoranda of Understanding (MoU) with the Volta Regional Directorate of Education to help stem the situation. The MoU, pave the way for PoP to complement government’s effort in providing classroom blocks and other teaching and learning materials for schools in deprived communities for the next five years. The charity organisation which started operations in 2012 has already built classrooms for 53 schools in 15 districts of the Volta region within the last two years. Mr. Freeman Goba, Country Director of the organisation said Pencils of Promise is committed to providing 500 school blocks in Ghana by the end of 2015. This, he said is in fulfilment of the Organisation’s mission of bringing smiles on the faces of the less privileged, through the provision of shelter and logistics to deprived community schools. Figures from the Education directorate, indicated that there 1,501 temporary classroom structures at the Kindergarten, Basic and Senior High Schools levels whereas 4,029 dilapidated classroom blocks at the various levels needed major rehabilitation work across the region. Deputy Volta Regional Minister, Mr. Francis Ganyaglo who witnessed the MoU signing, said though government is doing a lot in the provision educational infrastructure and logistics, there is still much to be done and applauded Pencils of Promise for coming in to support government’s efforts to provide accessible and quality education for all. Alhaji Mohammed Haroon, regional Director of Education who expressed excitement about the partnership, said it will foster a stronger collaboration between the Ghana Education service and Pencils of Promise in ensuring better educational outcomes and pledged his outfit’s support towards the implementation of the agreement. 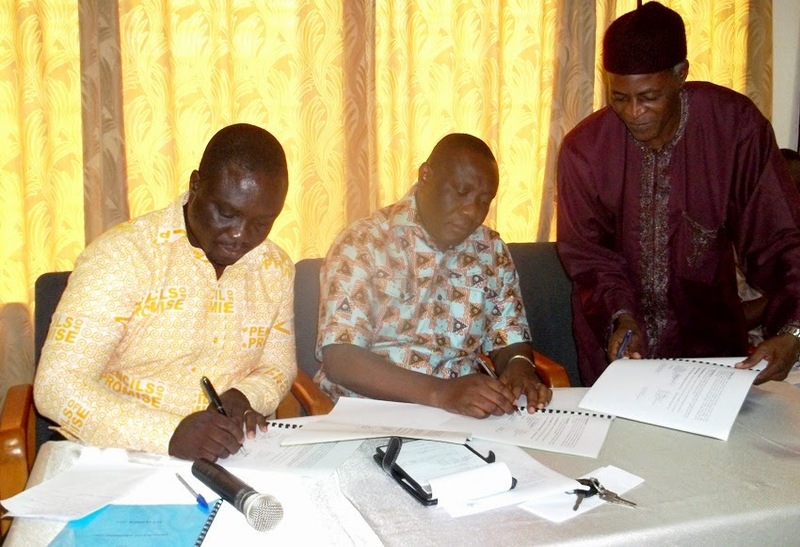 Present at the signing ceremony were Chief Executives of some of the beneficiary districts, led by their Dean, Michael Adjaho DCE for Agortime-Ziope district. Currently operating in 15 out of 25 Districts of the Volta region, the organization intends to expand its activities to the remaining ten districts and other regions in coming years. Pencils of Promise have provided full scholarship to 80 students in Junior High and Senior High Schools, with the commitment of extending it to cover 200 beneficiaries by 2015. The organisation has also recently introduced a Self Organized Learning Environment (SOLE) project, aimed at encouraging students to participate effectively in their studies through the use of technology. Under this project, students are provided with electronic devices (E-readers) to enable them access the internet and do basic research on their own and make presentations on their findings, leaving the teachers in purely guidance positions. This is currently been piloted at Toklokpo D.A. Primary School and Agorhome RC Primary School all in the South Tongu District of the Volta Region.